Your Render Can Look Brand New Clean Render or Your Money Back! 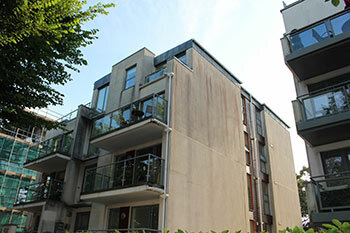 Does your building’s exterior render look dirty and unsightly, covered in dirt, algae, pollution? Over time render does become discoloured and thankfully there is something affordable that you can do about it. Purple Rhino render cleaning Kent will professionally clean your render and restore it to its original state. You won’t believe your eyes, the transformation will be fast. Call us NOW on 0800 157 7484 for your no obligation quote and we’ll come to you for a FREE test clean. Our expert teams have been highly trained using the latest steam cleaning technology. 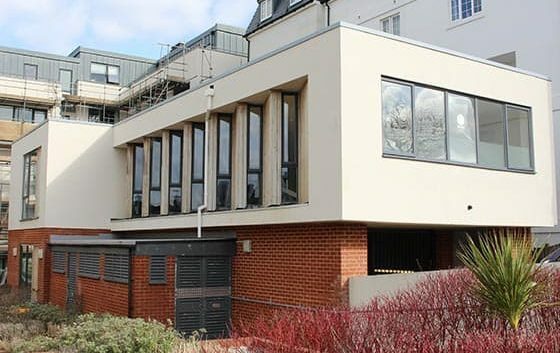 We’ve been render cleaning in Kent for over 30 years, and we will carefully clean your building’s render and put it back to the way it was supposed to be – fast and and a great price. By using a ‘soft’ system of steam cleaning, we can reach places that other systems can’t. We guarantee you a complete transformation without damaging your walls or building’s fabric.Varying pressures of steam, enable us to gently but thoroughly clean. Extremely hot steam will remove dirt and matter and prevent moss and algae and other organic matter from growing back by killing off spores. Other companies use a pressurised water system but we find that is destructive to your building and render. Water can enter into the fabric of the building resulting in future problems and delicate render may end us cracked and destroyed. Varying pressures of steam, enable us to gently but thoroughly clean. Extremely hot steam will remove dirt and matter and prevent moss and algae and other organic matter from growing back by killing off spores. Other companies use a pressurised water system but we find that is destructive to your building and render. Water can enter into the fabric of the building resulting in future problems and delicate render may end us cracked and destroyed. 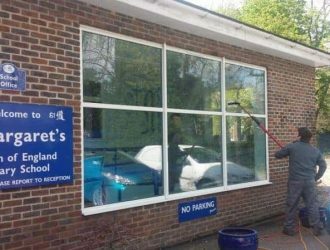 As the preferred render cleaners in Kent for blue chip companies – we know better than most just how important the exterior look of your building is for business. 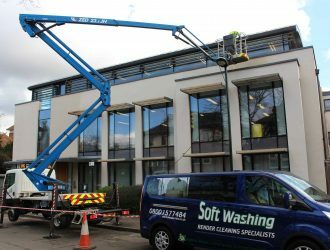 But whether you are a business, a hospital or local government building, a retail unit or a home – a professional clean with Purple Rhino render cleaning in Kent, will give you a professional and beautiful look. Why settle for an unsightly exterior, when it is so easy to clean it up and your render will be looking brand new. We highly recommend not to paint your render. It could destroy it forever. A simple clean will remove all traces of dirt and grime and prevent build up for years to come. 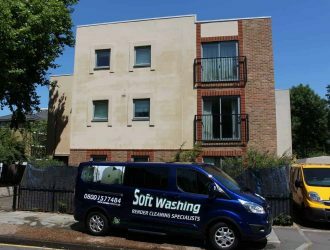 We provide environmentally friendly render cleaning in Kent – wherever possible we will NOT use chemicals on our render cleaning. Make those first impressions last. 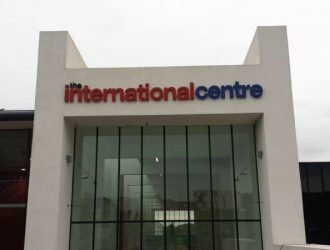 Your building’s render is the first thing that visitors are going to see. So make it a good impression with Purple Rhino render cleaning in Kent. Don’t settle for dirty, grimy render when it can be restored to its old sparkling self in no time at all. We’ll send out our professional and expert team to give you a FREE sample test clean along with a no obligation quote. So, pick up the phone, don’t wait any longer – call us NOW at Purple Rhino render cleaning in Kent on 0800 157 7484. Removal of algae and moss isn’t as straightforward as it seems to be. Many building owners place their trust in local builders or commercial contractors to undertake the remedial works but without the correct expertise. This can prove to be a costly mistake. Render cleaning without the necessary skills can cause serious and irreparable damage. 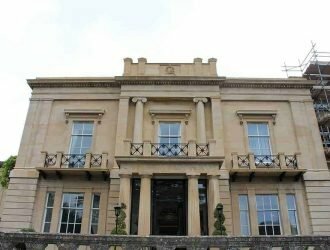 restored with no damage to the render. Before starting any project we conduct a thorough assessment of the surfaces to be cleaned. This makes us ensure that we use the correct techniques to clean the render as effectively as possible. 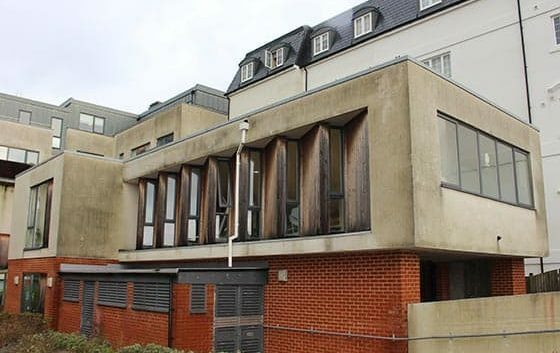 Incorrect assessments of the render, inexperienced operators and poor cleaning techniques can cause unwanted damage to the surface which will need further repair. The incorrect use of a pressure washer for example simply pushes the water deeper into the surface causing damage. The water can then freeze in cold temperatures and cause cracking to the render. This will result in expensive repair or replacement works in the future. Furthermore, incorrect pressure washing doesn’t kill the mould spores and these will continue to grow, reappearing again in a few weeks or months. Here at Purple Rhino we have the skills, knowledge and experience to deliver professional render cleaning services that you can trust. 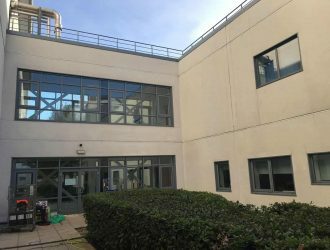 If you are looking for professional render cleaning services which can restore and preserve the render on your commercial, industrial or residential premises, please contact us for a free quote. 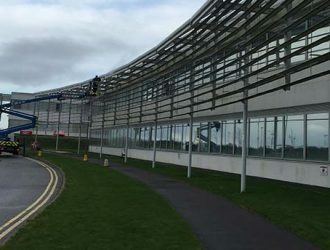 I contacted Purple Rhino with a view to cleaning the external K Render panels on our large out of town retail park in Llandudno. 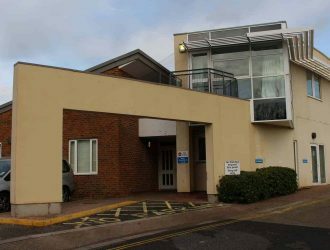 The works were completed effectively on time, within budget and the K Render panels were extremely clean upon completion. This is was the first time I have used them but would definitely consider using them again. The operatives gave me the impression that they were knowledgable, conscientious and hardworking; and kept me informed. Having had an unsightly staining problem at one of our blocks we sought the advice of Purple Rhino. Purple Rhino met with us at the property and explained their procedure. Immediately we felt confident with their knowledge and assurance this was a job they could tackle. They explained in detail how the process would work and answered all of our queries, of which there many. A test patch was carried out prior to the works. On site we received nothing but praise for the professional approach the men had on site. 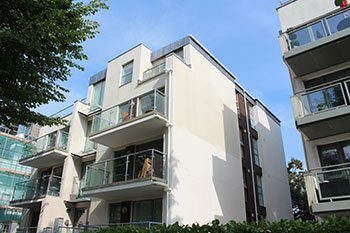 Once the work was complete the residents were extremely pleased with the results of the cleaning and the overall difference it made to the block, it looked like new. We will certainly use Purple Rhino again for any upcoming projects that require their services. 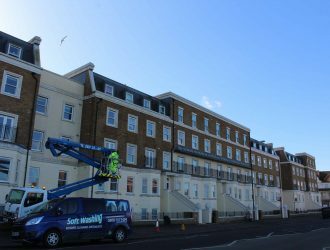 As always, Purple Rhino have carried out the ultimate K-Rend, render cleaning to this extremely large apartment block in Margate. The through coloured render was extremely dirty but now thanks to the render cleaning team at Purple Rhino the buildings K Render looks like new. We have worked with Purple Rhino K-Rend Render Cleaning specialists for more than 5 years and are always delighted with the service and excellent results from the whole team.